A Guest Post by Carol Cox. I made these bags for my grandchild’s kindergarten class, filled with a little candy and a small toy or two. They make quick, cute favors. I also enjoy making and using plarn, after I found out about it on the internet. So uniting one of my favorite holidays with a favorite craft resulted in these small bags. Hope you enjoy making them as I did. Gauge: The gauge will vary based on the plarn. Heavier bags make thicker plarn. 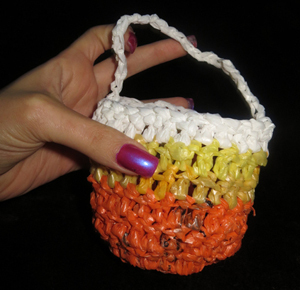 First, you make your plarn from the plastic bags, making each color into its own little ball. NOTE: if not using plarn, a medium weight yarn in the appropriate colors should work. To make plarn: smooth out your plastic bags and fold into quarters length-wise, cut into 1” strips, snipping off handles and bottom edge. Loop together to fashion a plastic yarn – hence the name plarn. For complete instructions on making plarn, please see the tutorial How to Make Plarn (Plastic Yarn). Do not finish off, continue with handle. Chain 25 to 35 stitches to form handle, then slip stitch on opposite side of bag. Finish off. Fill with candies and give as favors! Carol is 58 years old, a retired English teacher. She is married, has 3 kids, 2 grandkids and 2 spoiled cats. Carol grew up in Maracaibo, Venezuela where she still lives and loves to knit, crochet, sew, quilt and collect recipes and nativity scenes. Her current project is writing her own cookbook. This entry was posted on Saturday, October 20th, 2012 at 12:00 AM by A Guest Writer	and is filed under Free Crochet Patterns. You can follow any responses to this entry through the RSS 2.0 feed. You can skip to the end and leave a response. Pinging is currently not allowed. it WAS fun. the Plarn took some time to make, but i could crochet up 2 or 3 in an evening while watching the news. they are simple little bags and easy to make. This is cute but I never see orange or yellow bags around here. I only have white and gray. i guess i am just lucky that the markets here all use colored bags…and i mean ALL colors. but if you can’t find colored plastic bags, scraps of medium weight yarn should do fine… it is hard for me to find yarn here in Venezuela, it is a tropical country so we don’t knit. plastic bags we do have a lot of.. hope you try it with yarn.